Foods for Litha include anything ripe at midsummer. This is high season for many summer fruits and vegetables. If you don't have a garden, check out your local farmer's market or roadside stands. Also suitable are hot spicy foods or foods made with the sun to honor this solar holiday. Emphasize solar colors of gold, red, orange, and yellow; or the deep leafy greens of high summer. For background information and ritual ideas, see our main Litha page. 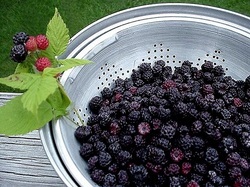 Put the black raspberries in a small bowl. Add the lemon juice and 1/4 cup of the sugar. Cover with plastic wrap. Allow berries to macerate for 2 hours, stirring occasionally. Pour the half-and-half into a large bowl. Add the remaining 1/2 cup of the sugar and whisk until dissolved. Add the vanilla extract and whisk it in. Carefully pour just the juice from the berries into the half-and-half, then whisk to blend. Reserve berries for later. Turn ice cream machine ON. Pour the half-and-half mixture into the ice cream machine. Freeze for about 30 minutes. Add reserved berries to the ice cream, about a spoonful at a time. Allow to churn for another 5 minutes. Turn the ice cream machine OFF. Transfer ice cream to a container and place in the freezer. Allow to freeze for at least 2 hours before serving. Freezing and then thawing fruit ruptures the cell membranes so that it releases its juices and flavor more when macerated. This makes thawed fruit better than fresh fruit for ice cream recipes that involve pouring the fruit juice into the ice cream batter before adding the fruit chunks. It also tenderizes the fruit itself, making it less prone to freeze into solid little rocks in the ice cream. I made this with half-and-half because I didn’t have whipping cream and whole milk. It makes a slightly lighter but still scrumptious texture. I also reduced the usual amount of dairy product from 3 cups to 2 ½. This tastes great, and it reduced the tendency of the ice cream to overflow my ice cream machine. This ice cream turned out a rather bright shade of medium purple. This recipe should also work with other types of berries or fruit such as red raspberries, boysenberries, etc. This recipe was originally published in The Wordsmith's Forge on 7/11/08, then revised for reprint 6/22/11. Put the cherries in a medium-sized glass bowl. Add 1/3 cup white sugar and 1 tablespoon lime juice. Allow to macerate for at least two hours, stirring occasionally. In a second bowl, combine 1/2 cup flour, 1/2 cup rolled oats, 1/3 cup firmly packed brown sugar. Then stir in 1/3 cup crushed lime-shortbread cookies and 1/2 teaspoon ground ginger. Slice the butter into squares and add to the dry ingredients. Use a butter cutter to mix the contents until loose and crumbly. Stir the cherries and spread them in the bottom of a glass pie plate. Then sprinkle the crumble topping evenly over the cherry filling. Bake at 350º for 20-25 minutes, until topping is golden-crisp and filling is bubbly. I used frozen cherries this time. Fresh ones should also work. These are not dual-purpose cherries, but true sour pie cherries, and the finished dessert is pretty tart. Dual-purpose cherries might work, but not sweet ones. The lime-shortbread cookies should be crushed to crumbs and small chunks; they don’t need to be powdered. Any kind of hard crumbly lime cookie would do fine. These were shortbread coated in powdered sugar. They’re a little prone to burning, but burned bits can be carefully scooped off with a spoon. This cherry-limeade crumble dessert was received with great enthusiasm. This recipe was originally published in The Wordsmith's Forge on 3/18/09, and revised for reprint 6/22/11. Zest the lime to remove all the outer skin, either with a zester or a fine grater, catching the zest in a small bowl. Add 1 cup sweetened coconut flakes to the bowl of zest and carefully fluff together until well mixed. Set aside. Cut the lime in half and juice both halves into a large bowl. To the large bowl, add 1 1/4 cups Chaokoh coconut milk, 3/4 cup heavy cream, 1 cup half-and-half, and 1/2 teaspoon vanilla extract. Whisk together. Slowly add 2/3 cup sugar and whisk until dissolved. Turn ice cream machine ON. Pour coconut milk mixture into ice cream machine. Freeze for 15 minutes. Slowly add the sweetened coconut flakes and lime zest to the ice cream. Freeze for another 5 minutes. Transfer ice cream to a container and place in freezer until set firm. Leave it in the freezer overnight so the flavors can marry. Serve the next day. Persian limes are medium size and dark green with thin skin. They have a bright chiming flavor. If you can’t find Persian limes, Key limes should work; they’re smaller with an even higher note, so you might need two. Ordinary limes are large and look like green lemons, with a less sprightly flavor; start with half of one, then check the flavor and add more if necessary. If you find that the coconut flakes clump around the paddle, try running the coconut flakes through the food processor to make them smaller before adding them to the ice cream. This is not an ice cream that you can eat immediately; it’s good right out of the churn, but the lime and coconut really need time to blend together. This recipe was originally published in The Wordsmith's Forge on 5/11/09, and revised for reprint 6/22/11. Pour the turkey stock into a large crock pot. Turn the pot on High and put the lid on it. Peel the onion and coarsely chop it. Put the chopped onion into the crock pot. Into a mortar, place 1/2 teaspoon coarse sea salt, 1/4 teaspoon Muntok white peppercorns, 1/8 teaspoon whole coriander seeds, 1/4 teaspoon dried thyme. Grind with mortar and pestle. Set aside. Rinse the chicken and pat it dry. (If there are giblets: remove them, rinse them, and throw them into the crock pot.) Rub about three quarters of the spice blend onto the chicken. Carefully lower the chicken into the crock pot. Scrub the baby potatoes. Gently wash the baby bella mushrooms. Pack them into the crock pot around the chicken. Sprinkle the remaining spice blend over the vegetables. Leave the covered crock pot to cook for about two hours. Carefully ladle some broth over the top of the chicken. Move the vegetables around so that any that were exposed will be submerged. The chicken and vegetables will exude more juices over time; if there isn’t enough, add a little bit of water. Put the lid back on the crock pot and continue to cook for another two to three hours; time will vary depending on chicken weight and your crock pot’s power. About once an hour, move the vegetables around. The chicken will be done when its juices run clear and the meat flakes easily. Potatoes should be tender when pierced with a fork. If you don’t have turkey stock, use a can or two of chicken stock or chicken broth instead. I made turkey stock, and it’s wonderful, so I’m using it. The white peppercorns are important in this recipe. You could substitute black peppercorns, but that would lose the delicate “white” flavor of the recipe – the white peppercorns blend marvelously with the coriander and thyme. Plain salt instead of sea salt would be okay, but use less; fine table salt packs more densely than coarse grains. Baby bella mushrooms are immature portabellas, and they’re not cheap unless you get lucky and find them on sale. Plain button mushrooms would work just fine. This recipe was originally published in The Wordsmith's Forge on 1/22/09, and revised for reprint 6/22/11. Set a large pot of water to boil; it will need to reach a rolling boil to scald the tomatoes. Set a large pot of cold water beside it. Peel the onion. Dice it and put the bits in a bowl for later use. Wash the Yellow Roma tomatoes. Cut the ends off. Carefully cut a line down one side. Dunk them, 3-6 at a time, in boiling water for 30 seconds. Transfer them to cold water. Pull the skins off. Put the peeled tomatoes in a bowl. Dice the peeled tomatoes – they’ll pretty much turn to slush – and scrape the results into a bowl. Pour the Yellow Roma tomato slush into the crock pot and turn it on Low. Add the diced onion. Stir together, then cover the crock. Repeat the same process of scalding and dicing with the yellow beefsteak tomatoes. Add them to the crock pot, and stir. Add 2 cups of frozen yellow corn kernels to the crock pot, and stir. Gather several fresh lemon basil leaves and use kitchen scissors to snip them into the crock pot. Do the same with the fresh sweet basil leaves. Add 1/2 teaspoon dried sweet marjoram, 1/2 teaspoon dried thyme, and 1/2 teaspoon sea salt to the crock pot. Stir. Grind white pepper over the surface of the sauce. Stir. Cover and ignore for a while. Every half-hour or so, stir the sauce. It will eventually cook down and thicken. Watch for the onion to become translucent and the squash to soften. The tomatoes should turn to thick liquid with a few solid bits. The color should be golden yellow to pale orange. Add 1/4 cup cornstarch and 1 tablespoon golden syrup, until it has the desired texture and flavor. Serve immediately or transfer to containers and freeze for later. 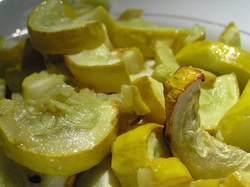 Yellow Roma is a type of “sauce” tomato. These tomatoes are long and narrow, intended to cook down to a nice paste or sauce. They are related to the more familiar Red Roma type. Yellow Banana tomatoes are another yellow sauce tomato, a little sweeter and fruitier. DO NOT use ordinary canned tomato paste in this recipe! It’s made from the standard Red Roma type tomatoes, and will make the spaghetti sauce darker. The other kind of tomato is often called a “beefsteak” or “slicing” tomato. They are round with firm flesh. Yellow tomatoes tend to be milder and sweeter than red tomatoes. Pretty much any variety of round yellow tomato will work for this part of the recipe; use what you can find. If the sauce is too juicy, here are some options for thickening: 1) Turn to High and leave the lid off so the sauce will cook down more; check it every ten minutes or so. 2) Add a little more cornstarch. 3) Skim off some of the translucent liquid that floats to the top. If the sauce is too tangy, add more sweetener. This sauce benefits most from a light, golden-flavored sweetener. Wildflower, basswood, or any other very pale yellow honey is ideal. Clover or mixed-flower honey (the most commonly available ones) is medium to dark gold; it might work, but be careful. Anything darker is too dark. Light brown sugar works; dark brown sugar is too dark. White sugar may work; just add it slowly and taste often, because it’s super sweet. Light corn syrup would probably work, if you like its flavor; I don’t. If the flavors sound good to you, but you don’t like a chunky sauce, then you can either: 1) puree the vegetables in a blender before combining them, 2) mash the cooked sauce, or 3) put the cooked sauce through a strainer. This sauce is good when topped by Parmesan cheese. This recipe was originally published in The Wordsmith's Forge on 10/6/08, and revised for reprint 6/22/11. Peel the squash and slice very thin. In a nonstick skillet, put enough olive oil to cover the bottom and turn on the heat. Add a pinch of salt. Rinse and pat dry the herbs. Use kitchen scissors to cut the herbs into small bits and put about half of them into the oil. Add the slices of squash, arranging them so that as many as possible are flat in the pan. Cut the remaining herbs onto the top of the squash slices. Cover and cook for 5 minutes. Uncover the skillet and turn over the squash slices. Cover and cook for another 5 minutes. Check the squash at this point; it’s done when the slices are fully tender. If necessary, turn them again and cook for another 5 minutes. Squash tastes good with most sweet herbs. Different types of basil will give slightly different flavors. Young squash is more tender and sweet; older squash can get tough or bitter. For this recipe, 4-8” squash is best. If using small squash, you may need two. I used fancy sel gris for this recipe. Plain table salt or sea salt would also work. This recipe cost nothing out of pocket. We already had the olive oil (which probably cost a couple bucks for the bottle), I grew the herbs myself, and the squash was a gift. This recipe was originally published in The Wordsmith's Forge on 7/29/08, and revised for reprint 6/22/11. Rinse strawberries and pat dry. Remove hulls. Chop strawberries into small pieces and place them in a bowl. Sprinkle with 1 tablespoon sugar. Pour 1/2 cup heavy whipping cream into a mixing bowl. Add 1 tablespoon sugar, 3/4 teaspoon rose flower water, and 1/4 teaspoon vanilla extract. Beat with a whisk until the mixture thickens. It should be about halfway between liquid cream and whipped cream, so that it flows thickly and clings rather than standing up. Stir the strawberries and divide them into two servings. Pour half of the thickened cream onto each serving of strawberries. This recipe is optimized for fresh ripe strawberries. If that's not what you have, make something else. This one relies on the delicate floral top notes, which do not survive preservation well. If you can get wild strawberries, even better. I called this a "fog" recipe because it's made with thickened, half-whipped cream. When I'm making a dessert with fruit and fully whipped cream, I tend to think of that as a "cloud" recipe; this is at a lower level, hence "fog." If you stir the strawberries and cream together, it will turn pink. Rose flower water is an ingredient available in ethnic or international food stores. 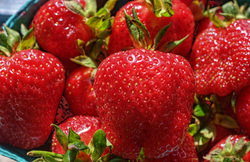 It doesn't really have a flavor, but rather adds a kind of furry texture and marvelous fragrance to fruit dishes, especially with strawberries. If you don't have any, you can leave it out. The cream will still be good just with the vanilla; or you can substitute another flavor such as a pinch of powdered ginger or cinnamon. This recipe was originally published in The Wordsmith's Forge on 5/15/10, and revised for reprint 6/22/11.